Craftsman Style House Plans: What is a Craftsman House? Craftsman style house plans are noted for an open flow within the house and a focus on good craftsmanship. The Craftsman house, in its various forms, was America’s adaptation of the Arts and Crafts movement as it applied to Architecture. This same movement spawned similar architectural outpourings across the world, each adapted to the local conditions. In America Craftsman style house plans became associated with the bungalow and the foursquare, two styles noted for their simplicity and their open architecture. So what are the clues that can help you identify a Craftsman? Porch columns having sloping sides and resting on a masonry base standing about as high as the railing. For those who have read my Gothic Revival information this will seem like old history. This is because the Arts and Crafts movement grew out of the Gothic Revival. It shared many of the same ideals, but did not want to be bound to the Gothic. It was the child wanting to find its own way in the world. As a result Arts and Crafts movement design could look Gothic and be distinctly modern at the same time. This affected the Craftsman style house by allowing architects to explore new forms while still holding true to the ideals of craftsman built housing. There was also a Japanese element to this. In 1862 there was an International Exhibition in London which had a Japanese display. This was just as William Morris and his peers were starting the movement. Japanese art, especially their woodblock prints, and Japanese architecture was something new and different and exhibited the kind of craftsmanship that the Arts and Crafts movement espoused. Its effect on house design is perhaps felt by the exposed beams that carry on past the walls, and in the open floor layout of the bungalow soon adopted into Craftsman style house plans. At its best, Craftsman houses met all the ideals of the Arts and Crafts movement. More typically the Craftsman style house plan had the layout correct but lacked the craft that the movement was trying to encourage. 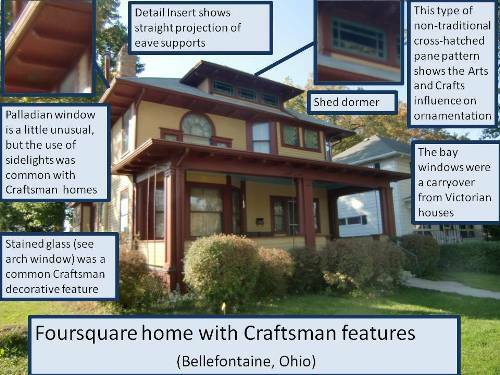 Craftsman houses are still built, but usually by individuals. I did come across this developer built Craftsman community and thought I should share it, to encourage a return to this style. I can't say how much is truly like a Craftsman, as I did not tour a house, but at least they have adapted the bungalow style and have a Craftsman look on the outside. 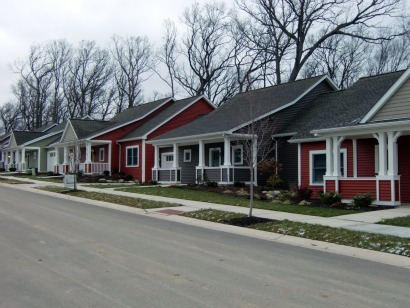 This is a "Senior Living Community" owned by UMRC. It is called "The Cedars of Dexter" and it is located in Dexter, MI. 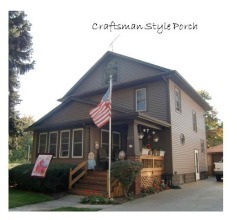 What a great example of a Craftsman bungalow. The bungalow became popular at the same time as the Craftsman style was being promoted and they were a natural fit. The "Ladies Home Journal" actively pushed both the Craftsman Style and the bungalow and it was an influential journal at the time. While not required, a dormer on the front was almost standard. The bungalow was originally a one-story house, but in America the one-and-a-half embodiment is much more common. Note the interesting arrangement of windows on this dormer. The eaves show the supporting rafters. The brackets under the gable eaves were simple triangular bracket. The Craftsman Style is a good house design for modern families, because it already includes the type of open flow that has been typical for the last several decades. Yet, having been bypassed by developers there is something new and fresh about this very old look. It hasn't become stale from over use. If you enjoyed this article, you may also be interested in my other articles on house styles, where I talk about Georgian, Federalist, Greek Revival,Carpenter Gothic, Italianate, Stick, Queen Anne, Second Empire, Tudor and Cape Cod style homes.